It began with a cleanser, a Pre-Cleanser to be exact. 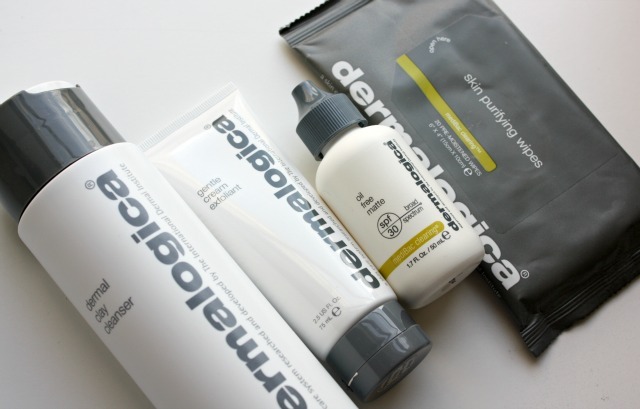 And what has since ensued can only be described as a growing affinity, ok LOVE for the Dermalogica brand. Having a blog has given me the amazing opportunity to try new products, test amazing formulas and build up a beauty arsenal that only a Hoarders: Buried Alive TV crew would appreciate. But as most of you know from following me for a while - my blog is a less of a news source of what's new and hot, and more of a beauty diary. Products I am using and loving - and want to simply run through the streets screaming about......well in a sophisticated and non-scary way. So I can always guarantee you that regardless of whether the product is purchased myself or generously gifted, only those things that give me butterflies or have me texting my mom instantly are featured. Seriously, my mom's text history tells it all. Ok, let's talk product. 1. Dermal Clay Cleanser* - If the creamy smooth texture doesn't get you, the minty fresh scent will. I use this clarifying cleanser after my initial cleansing oil or Pre-Cleanse, and it gives my skin a thorough deep clean without leaving it feeling dry and tight. 2. Gentle Skin Exfoliant* - It's a mask. It's an exfoliator. It's smooth skin in a bottle! Formulated with lactic and hydroxy acid, I was anticipating the standard tingle that goes with similar treatments. Instead the mask was gentle with no sensation, yet left my skin feeling bright, glowing and fresh. 3. Oil Free Matte SPF 30* - Caution - approaching holy grail status. My summer mornings are no longer complete without this product. Lightweight, refreshing and instantly hydrating, this moisturizer almost makes you think your skin will be left dewy and damp. And then a few minutes later, it dries down to a glorious matte finish that is the perfect foundation for my next step - foundation! 4. Skin Purifying Wipes* - If you've seen one wipe, you seem them all, right? WRONG. Just one wipe did wonders at removing my makeup, but where these really did their magic was after the gym or being out all day in the hot sun. They immediately refreshed my skin, removed excess oil and gave me a quick deep cleanse when a sink was not near.